The Bacon Werewolf dog (pictured above) was named by a staff member at Dat Dog, who took one look at the combo of Slovenian sausage, bacon, Creole mustard, sauerkraut, dill relish, grilled onions and tomatoes and said, “That’s one wild dog!” Dat Dog, a good-time hotdog spot with three New Orleans locations, has been offering the “Greenie Weenie” style as a bun alternative for about a year now, according to Bill DiPaola, president and COO of Dat Dog. “The genesis of the idea came from my need to lose weight! I thought, ‘If I’m feeling this way about carbs all the time, my guests do, too.’” He stayed on-brand and kept the integrity of the dog with plant-based “bun,” a leaf of romaine that’s sturdy enough to contain the wild Werewolf and any other dog customers choose. This Sapporo-braised hot dog has a pungent, smoldering mojo. The flavors—Chinese mustard, kewpie mayo, sauerkraut, bonito flakes, sliced jalapeño, and beer-pickled mustard seeds — are a prime example of the juxtapositions at Rook, a contemporary Asian restaurant in Indianapolis’ Fletcher Place neighborhood. The chef, Carlos Salazar develops creations like chili-hoisin-peanut pork belly steamed buns, kim chi yogurt with blue cheese and pork cracklins. The tagline is “If ya don’t know, now ya know,” and one menu item worth getting to know is the Rook Dog. The Hawaii Dog is made Hawaiian Portuguese sausage, which is typically served sliced and fried at breakfast but found here in fun hot dog form. “Having evolved from island influences, it’s the island’s version of a Longaniza or Linguica sausage that tends to have sweeter notes to it,” said owner Henry “Hank” Adaniya. The locally made sausage is scored for a more charred surface and grilled, then dressed with mango mustard and housemade pineapple relish. 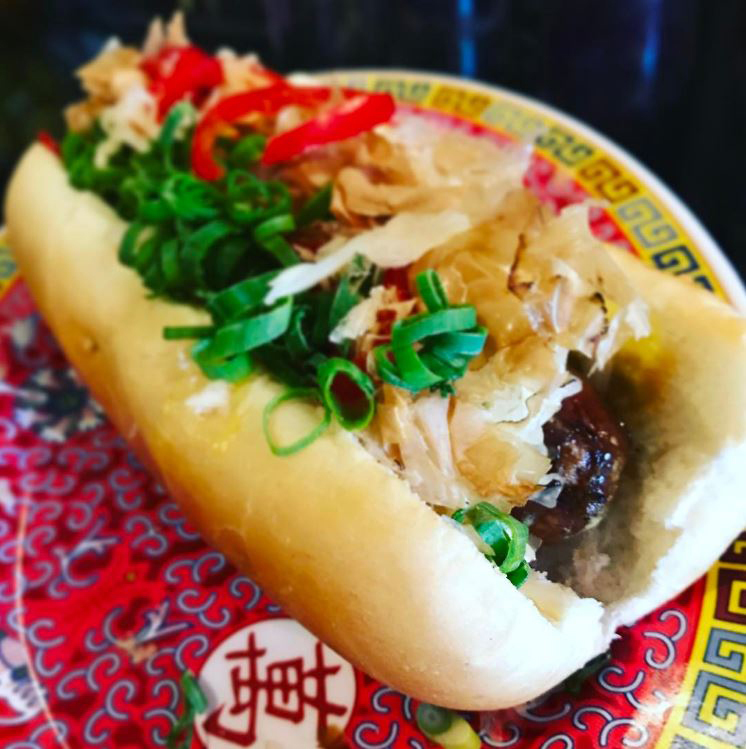 After running the acclaimed Chicago restaurant Trio for more than a decade and mentoring chefs like Grant Achatz along the way, Adaniya brought his culinary game — and his love of the Chicago Dog — to Hawaii, where he’s opened three locations of Hank’s Haute Dogs, including one at the Maui Sheraton Resort.